Adventures In Creating: Coffee Table is Here Again! I've been so anxious and excited the past few weeks I just can't contain it anymore! In just a few short weeks my MIL is coming in town for a whole week!! WOO HOO! What? You don't get this excited when your in-laws come to visit? Well I do; for a few reasons. First of all she is super fun and awesome to hang out with. Second of all, she says she's coming to visit us but I really know she's coming to visit the Con-Man ;) Which is totally fine with me because this means that I will have chance to have some one on one time with my welder! Like 6 months ago.... I had high aspirations to finish is in a timely manner but between my job, The Hubs job, and Con-Man I could never find enough time to work on it. I had finished one part of the table but it ended there. I need to decide what sort of wood I want for the top. The original tables I had looked at were made of reclaimed railroad ties. So I did some research around to and priced reclaimed wood. What I found was pretty pricey- one guy quoted $3 a board foot. So for a 12' board that's $36! And I would need 3 or 4 boards at least. Yikes! 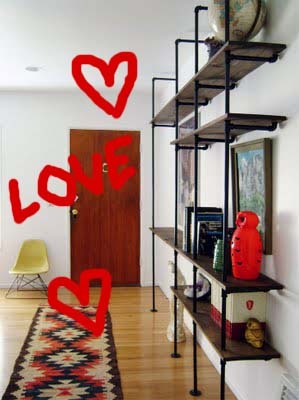 I totally want to make one of these shelves one day. But that's neither here nor there- I have a coffee table to focus on. So- in the next few days I'm going to scout out some wood. Maybe I'll get lucky and find someone tearing down a barn nearby. If not it's off to Home Depot I go. Good luck with the barn! 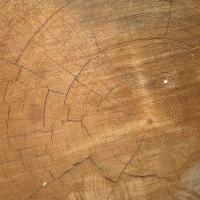 I wished you lived closer because I know where you could get old wood. We have an OLD farm in upstate NY which has a couple of old buildings which need to be torn down but we are not there so the wind and weather will claim them. Thank you for stopping by! I can hardly wait to try and make a few of the glasses. We have a BUNCH of empty bottles from French lemonade that are beautiful. In fact our middle son is always commenting on how he would like to have a set of drinking glasses that looked just like them. 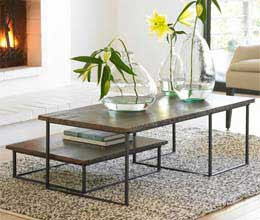 Good luck with your coffee table, the inspiration is awesome. I can't wait to see it when you finish.